I have loved every issue of this four book mini-series, but with the final issue of Doctor Star, I am left with a loss of words, as this mini-series might be the best mini-series I have ever read. Spoilers in case you haven’t read it. 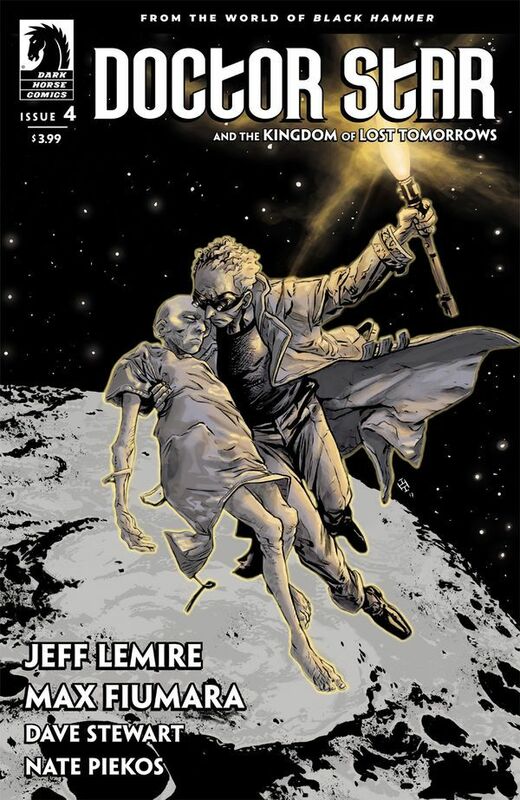 From Dark Horse Comics, the book is by Jeff Lemire, Max Fiumara, Dave Stewart, and Nate Piekos. As this is the final issue, we see Doctor Star, aka Jimmy Robinson, take on the hardest part of his life, harder than fighting intergalactic threats or battling super villains: we get to see a broken man spend the last moments with his dying son. He literally went to the stars and back, and all he found was the reality of it all: when it’s your turn to go, you got to go. This is an emotional book- we see when Jimmy learned his wife died, and when he learned his son fell ill, to clutching his son’s lifeless body on the moon. The theme of the book is to focus on what matters; Jimmy sees this in the end. He realizes instead of devoting his life to his studies and exploration, he should have focused on his wife and son, and shown his son the stars like he always wanted. Lemire and company pull off such an amazing tale, one that has no happy ending. It is very fitting, as Lemire has portrayed the grounded, surreal superheroes in the Black Hammer universe from the start, but with Doctor Star, he doesn’t pull at the heartstrings, he rips them clean out. The book looks fantastic, and with the final 8 pages or so, you will feel the loss, just like when you lost a loved one. It’s that emotional, the writing is that good, the artwork is that striking. Easily a perfect score in my book, you need to check out this mini-series, it is some of the most powerful sequential art pages you will ever read. Highly recommended.